The DCF SP binoculars were originally designed to compete in the high-end optics market but at a significantly lower price for that performance. 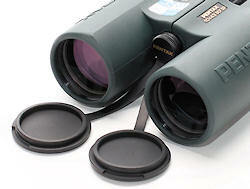 The Pentax DCF SP series are all roof prism binoculars. We evaluate all four models: 8x32, 8x43, 10x43 and 10x50 in this review. Pentax DCF SP binoculars cost between $540 and $800, which puts them solidly in the middle range of binocular cost these days. The DCF SP binocular line was one of the first we ever reviewed, and it remains one of our favorites to this day, particularly as these binoculars deliver such great performance and value. For starters, all DCF SP models are fully sealed, nitrogen-purged, water- and fog-proof roof prism binoculars. Sizes and weights of the DCF SP models are shown in the table below. 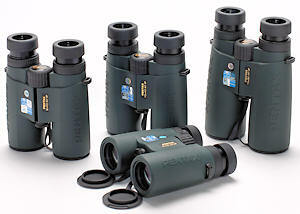 Pentax DCF SP binoculars are made on magnesium alloy frames and covered in forest green, rubber armoring. Due to this, most are lighter than average for binoculars of this size, with the exception of the 50-mm objective size models, which are of about average weight for that class. The rubber armoring is soft and slip-resistant for a secure, comfortable feel. There are shallow circular depressions under the barrels for the thumbs to fall into, thus positioning the hands so that the focus knob falls comfortably under the fingers. These are broad enough that for those with larger hands, the thumbs can be offset in the grooves without banging knuckles. The interpupillary distance range on DCF SP binoculars is fairly narrow, especially on the smaller side. This means that people with particularly narrow faces may not find these comfortable and they should check them for fit before purchasing. Weight 23.0 oz. 25.0 oz. 25.2 oz. 30.4 oz. Pentax DCF SP binoculars are made with BaK-4 glass, which is pretty much industry standard these days for quality binoculars. The objective lens is comprised of 4 elements, while the ocular lens is made of 5 elements, including the hybrid aspherical type found in many high-end binoculars today. Hybrid aspherical lenses require less glass (and thus weigh less) and reduce certain optical distortions. All DCF SPs have high-resolution, phase-coated prisms, fully multi-coated optical elements, and water-repellant coatings on exposed lens surfaces. The quality of glass and coatings is evident in the optical performance. Pentax DCF SP binoculars are bright, with crisp image quality that stays sharp to the edge of the field. The colors are bright and true, even under very low-light conditions. We noted only the slightest hint of a chromatic aberration on high-contrast objects under very bright light at the field edges, and virtually no edge effect. Since nearly all binoculars show these effects, the minimal nature of the ones exhibited by the DCF SP’s is strong evidence of their high optical quality. The table below compares vital performance characteristics for the four models of DCF SP reviewed here. How do you evaluate all these data? That depends upon which of them are most important to you. Field of view is a useful characteristic, and wider is typically better, so long as it isn’t accompanied by a higher degree of image distortion. In this regard, the 8x32, 8x43 and 10x43 models clearly outperform the 50-mm model. Relative to their class, the DCF SPs have pretty much average-sized fields of view. Eye relief varies across the four models of DCF SP but isn’t an issue: 17 mm will be comfortable enough for most users so 22 mm is more than adequate. The extra-light-gathering power of the larger objective lens may be important if you are frequently out and about at dawn or sunset. The focus knob on all the models is the same: large, covered with grooved, soft rubber for a good grip, and featuring very smooth action even on brand new binoculars. Minimum close focus on the three smallest DCF SP models was better than average for this property, and in fact, better than Pentax claimed it to be. The 10x50 model has a longer minimum close focus than the other three, though it should be noted this is frequently the case with 50-mm objective lens binoculars. Further, we found that the minimum close focus on the 10x50 DCF SP was better than published. We had little trouble getting a sharp image at about 9 feet, albeit with some collapse of the visual field. The DCF SP focus mechanism requires 1.5 turns to go from minimum close focus to infinity. This is about average for this property. Pentax went first class for the adjustable features: eyecups and diopter setting. For example, the eyecups are positioned with a helical twist, but instead of the typical all-or-nothing mechanism, these binoculars feature four positions stabilized by detents. As a result, virtually any user can find a position that maximizes viewing comfort and field clarity. The diopter adjustment is the usual twisting rubber ring on the right ocular, but it is a lift-and-click locking mechanism. To adjust, pull the ring out towards the ocular and twist in either direction to achieve the desired focus. Push it down to lock it securely in place. This is the best diopter adjustment mechanism. 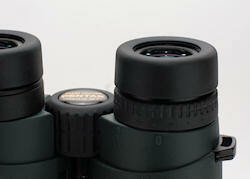 It is unusual to find fully-locking diopter adjustments on mid-priced binoculars, so we give Pentax full marks for it. The rain guard on all DCF SP binoculars is a pair of loose-fitting, hard plastic cups joined by a flexible bridge region. The strap threads through a bracket on the left side; the right bracket is gapped so the guard can be slipped onto or off the strap at will. This is basically a sound design, although the rain guards are a bit too loose and can be dislodged too easily. Thus, we recommend threading the strap through the right hand bracket as well when you aren’t actively using them. The objective lens caps are well designed. They are soft rubber caps that fit snugly into the armored ends of the barrels, each attached to a tether that allows it to swing down out of the way of the field of view. The tethers attach to a screw-in plate that when removed, reveals site for a tripod attachment bracket. The case is an attractive, padded, dark green cordura affair with a supple black leather bottom and black nylon trim. A Velcro closing flap has openings through which the binocular straps fit, allowing the whole assembly to be comfortably worn over a shoulder. This is actually an excellent case! The strap itself is the only disappointment: it is a bare black nylon web strap, barely an inch wide behind the neck and completely unpadded. The strap attachment poles are of a design that permits easy substitution by virtually any other kind of strap. Overall, the Pentax DCF SP binocular line is very impressive. The optical performance of these binoculars competes well on today’s binocular market. And at these prices, the DCF SP line is a fabulous value, period. These are serious binoculars for serious nature enthusiasts; we already see a lot of these in the field and we expect that to continue.